University of North Carolina School of the Arts in Winston-Salem. 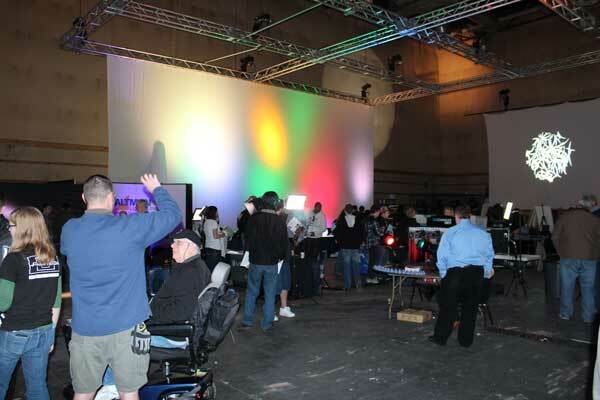 Nearly 160 students and professionals visited Stage 6 to see the latest production equipment from over 25 manufacturers. Special congratulations goes out to John Bailey of Express A/V and James Goins of UNC Greensboro who were the winners of the I-Pads that were raffled off at the Extravaganza to attendees who visited a majority of the manufacturers stands. Pictured here is James Goins receiving his iPad already loaded with the Barbizon Electrician's Handbook app. Thanks to all these manufacturers who exhibited.